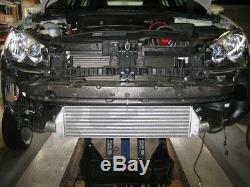 VW GTi 06-10 2.0T Front Mount Intercooler Kit. Oesn't come with installation instructions! 06-10 Volkswagen GTI 2.0T FSI FRONT MOUNT TWIN INTERCOOLER KIT This will fit: - 2006 2007 2008 2009 2010 Volkswagen GTI 2.0T 3 x piece polish aluminum pipe adaptor 2 x polyester reinforced High temperature silicone hose 5 x T-Bolt Clamp 1 x aluminum intercooler This intercooler is a dual intercooler set up which retains the stock intercooler. The result is now you get 2 x times the cooling. This is a bolt-on kit that retains the use of the OEM intercooler to produce both horsepower and torque. Now you can raise the boost and take it to the track without worrying about the car overheating or the motor detonating. INTERCOOLER SPECS: max horsepower capacity: 400-500HP core length: 25" core height: 6.75" core thickness: 2.75" inlet / outlet size: 2.25" end to end length: 30.50. We will not be held responsible. Please make sure that you have the right model and year of car. 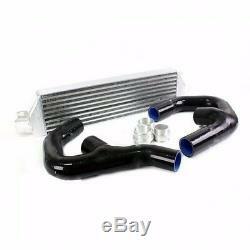 The item "Rev9 06-10 VW GTI FSI Jetta mk5 mk6 2.0t Turbo Front Mount Intercooler Kit v1" is in sale since Thursday, July 17, 2014. This item is in the category "eBay Motors\Parts & Accessories\Car & Truck Parts\Turbos, Nitrous, Superchargers\Turbo Chargers & Parts". 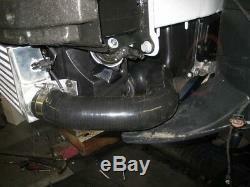 The seller is "airintakeandparts" and is located in El Monte, California. This item can be shipped to North, South, or Latin America, all countries in Europe, all countries in continental Asia, Australia, New Zealand. inlet / outlet size: 2.25"
end to end length: 30.50"